You’ve probably heard the terms cryptocurrency, crypto income, and bitcoin among others, floating around these past few years. While you may not have prepared any tax returns for cryptocurrency traders yet, the clients are out there. In fact, digital currency exchange Coinbase alone has 15 million people who own cryptocurrency on their platform. In order to be ready for the influx of clients, you need to know how to navigate new guidance, reconcile transactions on an 8949 without a 1099 B, and properly prepare a return with cryptocurrency assets. The Income Tax School is excited to announce a new partnership with Crypto Tax Academy, a division of Happy Tax, to offer you the best on-demand, accredited, self-paced/self-study crypto tax and accounting online training in the industry. This training is helping tax pros like you tap into this new market of clients and see BIG INCREASES in your average tax prep fee per client! 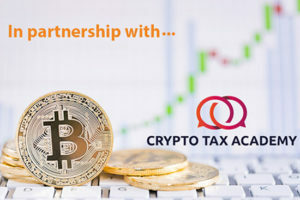 Whether you’re running your own practice, working for a firm, or are tackling tax resolution cases, Crypto Tax Academy can help you gain the knowledge needed to grow your crypto tax client book and feel confident in doing it. This is why we are so excited to bring them to you as a trusted partner of The Income Tax School! In 2014, the IRS released guidance on digital currencies requiring traders and miners to report and file their crypto income. Significant crackdowns on crypto tax reporting requirements were also announced earlier this year in the IRS press release dated March 23rd, 2018. Crypto Tax Academy offers two different training options, both include tax law content and marketing content, as well as exclusive bonuses! Learn everything you need to know to prepare crypto taxes for your clients, plus 3 additional bonuses including our proven email swipe copy to help you build your book of crypto clientele. 16 Hours IRS CE Included! This course includes everything in our “Fundamentals of Cryptocurrency Taxation” course and takes you into the deepest training knowledge-base of how to handle even the most complicated crypto clients including how to leverage section 199A for tax savings plus 6 total course bonuses. 30 Hours IRS CE Included!